Lois Szymanski Visited Delmar Again! 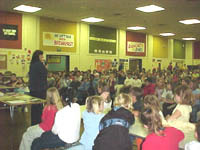 During the 2000-2001 school year Mrs. Lois Szymanski agreed to participate for a second year in the "Authors in Residence" program at Delmar Elementary School. 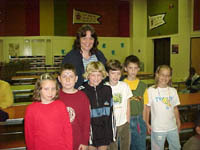 Six students in Mrs. Weeg's third grade computer class wrote stories with the help of their online mentor, Mrs. Szymanski, who has written many children's books. The project was very successful and enjoyed by all. The students were filled with excitement when Mrs. Szymanski wrote and said she was coming to Delmar to meet them and speak to the entire school. 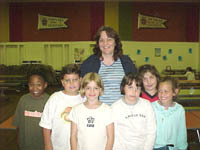 Pictured here are the six students who worked with Mrs. Szymanski in the 2000-2001 and 1999-2000 school years. Mrs. Szymanski met with the student body and talked to them about her love for horses and how she writes her book. She says it is important to exercise our "writer's muscle" because this will help us to become better writers. She told us that she rewrites her first drafts many times before her books are ready to be published. Mrs. Szymanski ate lunch in the school cafeteria with her 2000-2001 student authors. Thank you so much for coming to Delmar Elementary, to tell us about yourself, and your books. I love horses. I want one that is black, with a white diamond on his head. Out of all of your books, I liked the Perfect Horse the best. I also liked the one about the horse that was born with a perfect heart on his head, and the one where the firefighters saved that horse. They didn't know it, but they saved generations of horses. Where can I buy some of your books? I would love to have them! Again, thanks for coming to Delmar Elementary. Thank you so much for your sweet letter. I had fun visiting your school and telling you some of my favorite stories. I am glad you liked them! 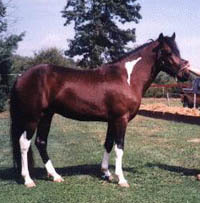 It sounds like your dream horse will look like the Perfect Pony! Your letter shows that you remember all my stories. That makes me feel very happy. You can order my books at any bookstore One day, I hope to read a story written by Hali Ramey! Have a great summer! Thank you for coming to my school yesterday. I like the Perfect Pony best because the black pony was good when it grew up and the princess pony was bad when it grew up. Thank you so much for your sweet letter. I enjoyed visiting your school and telling you some of my favorite stories. I am glad you liked The Perfect Pony. Sometimes the prettiest are not the best. Sometimes it is okay to think with your heart! Hello! Thank you for coming to Delmar. It was a good time with you. Please send me some more pictures. The horses are nice. I love horses. I wish I had one.Y our daughter was nice too.S he looked very nice!!!! Oh ya... Thank you for giving me a picture. I enjoyed getting to meet you and talk to you and spend time with you! You are a very special girl. I am glad you liked the picture. Here are a few more! I hope I get to see you next year, too! My daughter had fun coming along. She said all of the students at Delmar Elementary School were so very nice. I think she is right! When I get back the roll of film I just took, I will send you a picture of how big the baby Twister, is now! Have a great summer, and keep writing those wonderful stories! I like the story about the Unicorn . Is the Unicorn real? I like the unicorn story because the unicorn healed the baby pony and the old lady and the child. Thank you for writing. I enjoyed visiting your school and telling you some of my favorite stories. The unicorn story is not true. I made it up, using my imagination. That's so much fun to do! I am glad you liked my stories. Have a great summer! Thank you for coming to our School yesterday. I liked the story Little Icicle because the Fire Men helped the pony and she got better all winter long. I liked most of your stories! Thank you so much for your nice letter. I enjoyed visiting your school and telling you some of my favorite stories. Little Icicle is one of my favorite stories too. It reminds me that doing one kind deed can make a big difference! Have a great summer! I Iove your stories. They are good. I like the one the Perfect pony because it tells a nice story about a pony that didn't look good but he was good in the end. Thank you for coming to our school. I missed you because I was absent. will you coming next year? I am sorry that I missed meeting you. I hope to see you next year. Since you missed hearing the stories I will send you a picture of the real Sea Feather. It should be attached to this email. Have a great summer! Thank you fou coming to our school . I like the horse and I like little Icicle because it had a happy ending. Thank you so much for your letter. I enjoyed visiting your school and telling you some of my favorite stories. I am glad you liked the true story of Little Icicle. Two kind firemen saved that pony and the whole fire company worked to keep her safe! Have a great summer! Thank you for coming to our school I liked your stories about the horses . I liked the story and I learned how to make stories. I am going to make an idea folder. I am happy that you are going to make an ideas folder so you can write your own exciting stories! Then, you will know how much fun it is to be a writer. Thank you for your letter. I enjoyed visiting your school and telling some of my favorite stories. Have a great summer! Thank you for coming to our school. I liked when you read about the horses. I liked when you read about Little Icicle because I like horses and I was happy when Icicle was ok. Thank you so much for your kind letter. I enjoyed visiting your school and telling you some of my favorite stories. I am glad you liked hearing about the real-life story of Little Icicle. His mother, Icey and he were both very lucky ponies! Have a great summer! Hi how are you today? I liked you coming on May 21, 2001. I loved the book you shared with us. Thank you for coming. I'm really happy you came to our school. I hope you liked coming and reading. Thank you for your letter. I had fun visiting your school and telling you some of my favorite stories. I am glad you liked it, too. Don't forget to keep reading books and writing your own stories. Reading can take you places you've never been! Thank you for coming to tell me about Little Icicle and Sea Feather. I think the best book is Sea Feather because I like horses. It is nice to meet someone who likes horses, like I do! I enjoyed visiting your school and telling you some of my favorite stories. I am glad you liked Little Icicle and Sea Feather. You picked two of my favorite stories, becausse they are both true tales! Thank you for writing, and have a great summer! Thank you for coming to Delmar Elementary. I liked all the books but my favorite was Little Icicle. I liked when you came to all the 3rd grades. Thank you for your letter. I enjoyed visiting your school and telling you some of my favorite stories. I am glad you liked Little Icicle. I love stories about people who care enough to take care of the animals that need it. I believe it is okay to think with your heart! Have a great summer! Thank you for coming to Delmar Elementary school. You sould come back before the end of the school year. Come visit our class Compass lab in school. I liked the book Sea Feather. That is a good book. The next book I will read is "Hugs and Kisses." I will enjoy that book. I will enjoy next year's show. I hope to see you in the future. Thank you so much for your letter. I enjoyed visiting your school and telling you some of my most fun stories. I am glad you enjoyed the day. I hope to see you again next year. By then, you will have read both books and you can tell me how you liked them! Thank for coming to Delmar Elementary School. First the book was a big success. For example your book is a good idea for an idea folder. Thank you so much for your sweet letter. I enjoyed visiting your school and telling you some of my favorite stories. I am glad you thought about what goes in an idea's folder. I hope you start your own folder and write some super stories of your own! Have a great summer! Thank you for coming to our school. We appreciate you for coming to Demar Elemantary school. We liked the two books your wrote. They were fantastic books! You know you didn't tell us about the story you wrote about Hugs and Kisses. Do you know that the book about Hugs and Kisses is about twins? I have a brother and he is my twin too. P.S.thank you for the time of you being to our school. I wrote Hugs and Kisses because I thought it was a good "twin" story. Did you know that I have a twin brother, too? His name is Jim. We are more than twins, we are friends too. I hope you are friends with your brother. I enjoyed visiting your school and telling you some of my favorite stories. I am glad you liked them! Have a great summer! Thank you for reading us a story. I like the story Perfect Pony because the princess was bad and the black pony was good. I like horses. Thank you for coming to our school. Thank you so much for your letter. It is nice to meet and talk with another horse-lover! I enjoyed visiting your school and telling you some of my favorite stories. I am glad you liked The Perfect Pony. Sometimes the prettiest are not the best. Sometimes it is okay to think with your heart! Have a great summer! I want to thank you for helping me with my story. I really liked when we ate with you. Can you try to get me a picture of one of your horses? I had fun and thank you for helping me with my story.